Use the power of hypnotherapy to Master a Foreign Language – it’s easier than you think! You’ll see a new you and you’ll feel great about it!!! Steve G. Jones, Ed.D., Clinical Hypnotherapist, charges $1,500 for a custom recording and $25,000 for a one-hour private hypnotherapy session at his office. But you can get all the benefits for this low price. 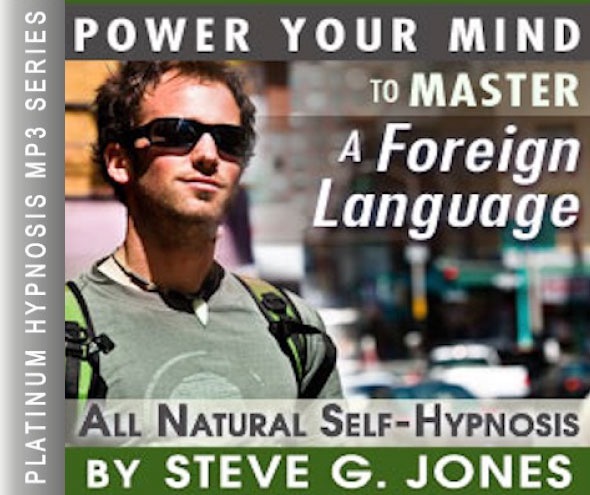 Simply listen to the Master a Foreign Language Hypnosis MP3 every night as you go to bed for three weeks and feel the changes happening in your life. You will feel more empowered, more in touch with your true self, and you will truly know that your goals are within your reach. Dr. Steve G. Jones achieves AMAZING and LASTING results!!! Hypnosis is the easiest way to affect change in your life because the positive messages go straight to your subconscious mind effortlessly so you can accomplish your goals and reach for the stars!! All you have to do is listen to the Master a Foreign Language Hypnosis MP3 session at night as you go to sleep!!! You’ll hear soft music, the gentle sounds of the beach, and the soothing sound of Dr. Steve G. Jones’ voice all working together to bring about positive changes in your life easily and naturally. And as you continue relaxing deeper, deeper, and more deeply relaxed, you realize that you have the ability to learn a foreign language. You are a very smart and intelligent person and you have the ability to speak any language you would like…fluently. As you continue to listen to this recording every night before you go to bed, during the day you spend time studying a foreign language. You can focus on any foreign language you want. Perhaps you would like to speak Spanish. Perhaps you would like to learn French or German or Mandarin. Whatever language you want to learn, go ahead and picture yourself studying it now. Imagine that you have books and software or perhaps a tutor who helps you learn this foreign language. While you are studying, your mind has an immense ability to soak up the language. Your brain is like a sponge. It takes in all the information that you are reading and listening to and are able to fully retain this information. You are able to comprehend things very quickly and efficiently. Your memory is flawless. Day by day you are learning more and more words. Your vocabulary of this foreign language is increasing day by day. Whenever you spend time working on learning this foreign language, you are very focused. Day by day your powers of concentration and focus are increasing more and more. You are becoming very focused, very focused, very concentrated on learning a foreign language. You are able to concentrate on learning and memorizing the new language. And as you relax, you now imagine focusing on learning this foreign language that you choose to master. Imagine yourself there in the moment, focused, relaxed, concentrating, blocking out any unnecessary situations, blocking out any unnecessary ideas, just focusing and concentrating on learning new words and learning the grammar of the foreign language, that’s right. Imagine yourself there, so very focused, that’s right. See yourself, see how calm you are and relaxed, how determined, that’s right. And this is how you will be from now on when you choose to study the language. You simply say the word focused and immediately you are focused entirely. Focused on learning a new language. You are able to concentrate. Concentrate for long periods of time. Blocking out all unnecessary information and concentrating. So relax now and realize just how powerful your ability to focus is now. Now I want you to imagine yourself one month from now. You have mastered the basics of this new language. You know hundreds of different words and you can easily put them together to form sentences. You continue to practice your new skill and you improve day by day. Now imagine yourself six months from now. You now have the confidence to speak the language. You are able to look back at the past six months and realize how much you know. You are so intelligent and motivated to speak this language and it shows because you have learned so much. If you are interested in going to a country that speaks this foreign language, I encourage you to do so. By going to a native speaking country, you will find that you have the ability to learn even more about the language. Picture yourself now in this foreign language. Everyone you encounter is speaking this foreign language that you have just learned. However, it is no longer foreign to you. People are speaking to you and you are able to fully comprehend what they are saying. If they say something you are not sure of, you have the ability to pick up on the underlying meaning and you quickly adapt yourself to every situation. You are able to speak the language fluently and effortlessly. People are able to fully understand what you are saying. You feel so proud of yourself for learning a foreign language. You have put in a lot of hard work and it shows. You are intelligent and focused and you now can speak another language and that feels wonderful. Learning a foreign language is a great way to activate your mind and improve your memory. In the long term, that is what learning a new language will do, it will improve your memory and help it stay sharp as you age.Learning a language is challenging and it takes time and patience. You will be doing your brain a favor by keeping it active and learning something new. In the short term, learning a foreign language has many benefits. Many people want to learn a foreign language because there is a need to learn it. Perhaps you are moving or living in a country and you do not speak the native language. This situation can be difficult at first, but as soon as you start listening to the Master a Foreign Language Hypnosis MP3 recording, your mind will act like a sponge and you will be amazed at how many new words you are able to learn. Hypnosis is a great way to help you master a new language. Hypnosis targets your subconscious mind. You are probably well aware that everything that you have EVER learned in your entire life is stored in your brain. It is a matter of ACCESSING that information that can seem difficult, but with the help of hypnotherapy you will be able to! In our world, English is the fourth most popular language. Ahead of English (in order of the most number of speakers) are Mandarin, Hindustani, and Spanish. An estimated one billion people speak Mandarin! There are so many reasons to learn a foreign language. For one thing, learning another language is fun! It is something new and exciting and different. Whether you speak one language or four, I encourage you to learn a new language. We are becoming a more global world. Many people are traveling internationally. Even in our own communities we know people whose native language is different from our own. We see different languages written on packages and billboards. We over hear people speaking a language that is very foreign to our ears. How great would it be to understand a foreign language when you see it and hear it? It will add greater awareness to the world around you and I believe it will add to your overall well being. Learning a foreign language through hypnotherapy will open new doors for you. It allows you to travel to distant places. Even if you are not fluent in a language, hypnosis will allow you to learn at a quicker and more effective pace. It helps to know some basic words when you travel to a place that speaks a different language. Just getting around, asking for directions, and using simple words that are used often will help you tremendously while traveling. Another good reason to learn a foreign language is to challenge yourself! When you were a child, your mind was like a sponge, learning everything around you, because there was so much that was new. When you are older, you should continue to learn new things to grow as a person. Hypnotherapy is a powerful tool that you should use to learn a new language. You will find that the Master a Foreign Language Hypnosis MP3 recording will greatly enhance your ability to learn, remember, and speak fluently.